The Mexican holiday, celebrated in early November, entices the spirits of the deceased back to Earth with their favorite foods. Yazmin Saraya, 28, speaks about Day of the Dead the way American ex-pats often speak of Thanksgiving – with nostalgia and longing. “I love it,” she said simply of the holiday, which she grew up celebrating in her native Mexico. Now pastry chef at Portland’s Five Fifty-Five restaurant, Saraya jumped at the chance to explain its traditions, food and otherwise, to Mainers. She explained in precise and enthusiastic detail the symbolic objects and colors of Day of the Dead, celebrated every Nov. 1 and 2, when Mexicans build tiered altars in their homes to honor friends and family who have died. The altars are meant to entice the deceased to return for a visit and, among other items, hold glasses of water to quench the thirst of souls after their long journey and vividly colored marigolds to help them navigate their way. In deeply Catholic Mexico, a cross is essential, too. This year, like most years since she left Mexico, Saraya – and her fiancé Kyle Robinson, chef de cuisine at Five Fifty-Five – traveled home in late October to get a taste of the approaching holiday. But not before speaking with us about what it means to her. Q: For readers who don’t know it, can you explain what Day of the Dead is? A: Day of the Dead is a very, very big celebration in Mexico. It started even before the Spanish people came. These days it is a mix between the Spanish and the original people of Mexico. It’s a very complex celebration. There is so much history behind it, and everything has a meaning. In Mexico – it’s kind of funny, because instead of feeling sad about a person’s passing, it’s usually a happy time. We celebrate the good memories of that person. Everybody is afraid of death. And it makes sad everyone, so in Mexico one way to defense is joking about it. A lot of people make very funny rhymes remembering that person’s life. There are a lot of places with random altars. You go to a hospital and they will put an altar to the doctors and all the patients they have lost. Or you go to a music school and they will have an altar to all the musicians who are gone, and they might put a guitar next to the altar. Or if that person liked to paint, you put a few paint brushes. Q: Do Americans confuse Day of the Dead with Halloween? A: Oh yeah. So much. I think they can’t even be compared at all. The reason that they get confused is they are very close dates. But we don’t wear costumes, and it’s not about hanging out with friends or going to parties. It’s about remembering the people you lost. Q: There are also all the skeletons and skulls, though. For Halloween, those things are a little scary and creepy. Is it the same for Day of the Dead? A: No. It’s not meant to be scary at all. Just to remember the person that passed away in a happy way. It’s more happy than creepy. Q: How did your family celebrate when you were growing up? A: I never met my mother’s parents. Well, my grandpapa passed away when I was 2 years old. And I never met my grandma. My mom made sure we always had an altar. Usually you put the favorite food of the dead person there so they can have a feast when they come to the altar. Mom would make that dish for the elder, but you would eat the rest of it. You are not supposed to eat anything from the altar. The souls they already ate the essence, the soul of the food. The favorite drink is a very important thing, too, because it’s an alcohol drink so it’s to remember the happy things. So whenever (the souls of the dead) come, they can remember the happy moments they had in their life and celebrate. My mom would always cook mole, and she would always put chocolate on the altar for my grandpa. He was diabetic so he was not supposed to eat chocolate, but he would always sneak out to have some. Or for my great-grandma, we would put cigarettes because we cannot even picture her without a cigarette in her hand. She smoked until she was 102, and she would cure everything with tequila. Everything. Head cold, stomachache, you just have a shot of tequila. My uncle would always make tamales and invite us over every Nov. 1, and we’d drink hot Mexican chocolate and we would have a family dinner. Q: Tell me about the special sweets for Day of the Dead. A: Sugar skulls are very important. They represent each family member. (For the altar) sometimes they even personalize them and put their names on their head. They used to be made with amaranth. Also, you bring those little skulls to your friends, like a little gift, and kids definitely eat them. Q: What about pan de muerto (translation: “bread of the dead”)? A: It’s kind of like a brioche. It’s like a bowl and on top it has the bones. It’s always present in the altars. Supposedly, it represents the bones of the dead people. (Bakeries) start selling them in August. They start selling them really early. It’s like here with Christmas. We’re like, “Really? (The holiday) is not even until November.” Sometimes on (Day of the Dead), you can’t find anything else in the bakery. You dip the pan de muerto in Mexican hot chocolate. Q: Is one recipe for pan de muerto pretty much like another? A: No. Some people brush them in butter and roll them in sugar. That’s what I do. Some people don’t have sugar. They are more on the line of being savory. Some people put in orange blossom water. Some people put in anise. Sometimes they do it with butter; sometimes they do it with a little bit of shortening. Some places they even fill them with stuff. All the states in Mexico fight about which one has the best. Q: As a professional pastry chef, have you tried to improve the recipe? A: I played around a lot with it. Especially now that I am here, because I cannot get it here the way they make it where I am from. People have gotten really creative with them, but I’ve been trying to get the traditional one. I haven’t done anything crazy. Q: How much do Mexican sweet traditions play a part in what you bake for Five Fifty-Five? A: So much. I always have the Mexican influence on the ice cream or one dessert. Right now I have tamarind sorbet or guava ice cream. Or for example, I made cajeta (goat milk caramel) ice cream. People were scared to order it. They don’t know what it is. I decided to put a berry sauce. Problem fixed. I always have to do little tricks like that. Or I make the servers try it. They try it and they love it and that takes care of the rest. Or Pastel de elote. Corn cake. But if I said corn cake here they would misunderstand it. They think they would get cornbread, but it’s not like that. It’s like bread pudding but it’s corn pudding. It’s like a cake, but it’s very wet. I put some grilled corn kernels in it, and I put it with the cajeta ice cream and a mixed berry sauce. It was perfect for the summer because we were using local corn and local berries. That corn recipe is a family recipe and my mom was not very pleased I put it on the menu. That one is a very special recipe for her, so she didn’t want me sharing it. She got over it and is happy about it now. Q: Is it morbid to ask what will be on your altar when you’re gone? What foods do you love so much they’d bring you back from the hereafter? A: I would definitely say chiles en nogada. It’s a poblano pepper stuffed with meat, and it also has dried fruit, fresh fruit, nuts. It goes in an egg batter. You fry it. Then you cover it with a walnut sauce. Then you top it with pomegranate seeds and cilantro. It’s for Independence Day, September, because of the season of the walnuts and the poblano peppers. And it’s very representative of Mexico, even the decoration when you plate it – it’s the Mexican flag. It has the pomegranate, cilantro and then the nogada sauce, which is white, so it’s red, white and green. It’s so complex and it involves so many things. It’s savory and sweet and it has so many components that for me it’s my favorite Mexican dish. 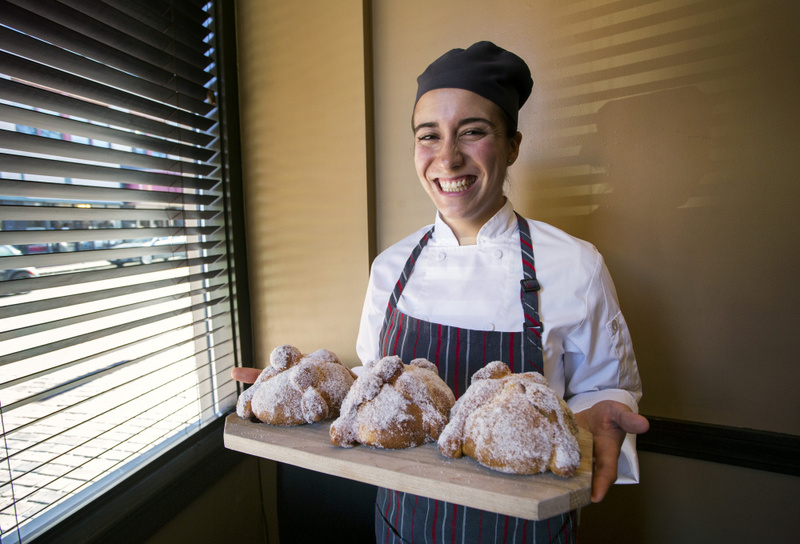 Saraya’s pan de muerto, a traditional bread for Mexico’s Day of the Dead. This fluffy, sugary, rich yeast bread is traditionally eaten for Day of the Dead. You’ll need a kitchen scale to make this recipe; Yazmin Saraya, like most professional pastry chefs, measures by weight, not cups. Mix the yeast, lukewarm milk and 1 teaspoon of sugar together in a measuring cup. Let sit in a warm place for a few minutes until the mixture foams. Using a stand mixer with a paddle, mix together the flour, salt and zest. Add the warm yeast mixture, then add the eggs and the orange juice. Add the 4.5 ounces sugar and mix the dough on slow speed until the sugar is incorporated and the dough is not too sticky, 10 to 15 minutes. Cube the butter into pieces about ½-inch in size, and add the cubes to the dough, little by little, while continuing to mix another 20 minutes to develop the gluten. Spray a bowl lightly with cooking spray, place the dough in the bowl, spray the dough lightly and then cover the bowl with plastic wrap. Let the dough rise in a warm place until it doubles in size, roughly 40 to 60 minutes, but keep an eye on the dough as the range varies. Portion the dough in 5-ounce pieces and shape them into balls. You should get 6 balls; reserve the remaining dough. Line a baking sheet with parchment paper. Transfer the dough balls to the sheet evenly leaving space between them. Let rise for 20 minutes in a warm place. While the dough is rising, preheat the oven to 325 degrees F.
Bake the pan de muerto in the preheated oven for 8 minutes. Rotate the sheet pans so the breads will bake evenly, then bake for an additional 8 minutes until the loaves are golden brown. Brush immediately with the melted butter and roll in the sugar. Let the bread cool at least 15 minutes before eating. Serve the bread with hot chocolate and enjoy. Ibarra chocolate is flavored with cinnamon. Bring the milk almost to a boil in a medium-sized pan on the stovetop. Meanwhile, chop the chocolate into 4 pieces. Pour the hot milk into a blender, add the chocolate and blend until the chocolate is incorporated and the mixture is foamy. Pour into mugs and serve.